The purpose of Homecoming is to promote a renewed spirit of Cowley County Community College. The week is full of exciting activities that focus on building strong tradition and bonds with classmates (past, current and future) and the Cowley community. Feb. 10 - Coronation of the Homecoming Queen and King, will take place at the halftime of the men's basketball game against Coffeyville that starts at 7:30 pm. Feb. 10 - The Homecoming Dance will be held immediately following the game. Click here for more information about the Coronation & Dance and to view the top candidates for King and Queen. Any group where all members are currently enrolled at Cowley are eligible to participate in Homecoming activities. Groups do not need to be registered student organizations to participate. For example, residence hall floors, ministry groups, sports teams, etc. are considered non-registered groups. If a group wishes to not enter all activities, but a select few, the group will still be allowed to compete in the Homecoming Activities. Only one event is required and that is the Banner Contest. However, groups are encouraged to participate in all Homecoming activities. If a group is not competing for the Sweepstakes Trophy Competition, groups must still register for each activity they wish to participate in. Any group that submits entries for ALL Sweepstakes' Events listed below will be able to compete for the Homecoming Sweepstakes Trophy. Student Life provides funds for certain events for any organization/group that signs up for Homecoming Sweepstakes. Read the rules for the Sweepstakes Trophy Competition. 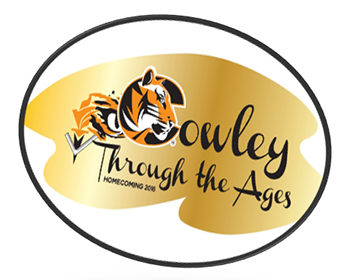 Each club/sport/organization participating in ALL the Homecoming events will receive a Cowley Thru the Ages Homecoming T-shirt. Download the Order Form for Thru the Ages Homecoming T-shirt in Word format or in PDF format. You must turn in the T-shirt Order Form with your Registration Packet.